Azerbaijan’s 2012 exhibitions calendar ended in November, and throughout the year the leading exhibitions company in the Caspian Region Iteca Caspian organised 20 specialised events alongside its international partner ITE Group. Two of these were held for the very first time - Ipack Caspian, the international packaging, labelling and printing exhibition, and SportExpo Azerbaijan, the exhibition dedicated to sport, sporting equipment and sportswear. The company’s exhibitions grew 40% in exhibitor and visitor numbers in 2012, featuring 1,767 exhibiting companies and over 60,000 visitors. Azerbaijani companies occupied 50% of exhibition space, and following the events a large number of domestic and international exhibitors did not hesitate to re-book their space for the 2013 editions. International activity at exhibitions in Azerbaijan continues to grow, and leading global firms such as Microsoft, OMV, Knauf, Statoil, Total, RWE, Human, Sietek, Toshiba Medical Systems, Kesali, Roche Diagnostics and Siemens are all regular exhibitors. The range of countries represented also expanded to 65, including a first appearance for Bangladesh, with Russia, Turkey, Germany, Italy, Iran, Belarus and Lithuania leading in this regard. The number of exhibiting national groups also grew to 29 - Afghanistan, Austria, Belgium, Bulgaria, Canada, China, Croatia, Cyprus, Czech Republic, Estonia, Finland, France, Georgia, Germany, India, Iran, Israel, Italy, Latvia, Lithuania, Malaysia, Portugal, Russia, Serbia, Slovenia, Spain, Turkey, UAE and the United Kingdom. As these national groups are organised by official bodies in the countries they represent, their participation shows the interest these countries have in expanding economic links with Azerbaijan. Sponsors and partners played an important role in the success of exhibitions. Nar Mobile (communications partner), AZAL (official airline) and the Hilton Baku and Qafqaz Point hotels (official hotels) were among the official partners, and event sponsors included SOCAR, BP Azerbaijan, Andrade Gutierrez, Caspian Geophysical, Conoco Phillips, Cross Caspian Oil and Gas Logistics, Det Norske Veritas, Ernst & Young, IGI POSEIDON S.A., Inpex Corporation, McDermott Caspian Contractors, MESC, Nobel Oil LTD, OMV Aktiengesellschaft, RWE, Statoil, Salans, TAP, Total E&P Azerbaijan, Velosi, Vietnam Oil & Gas Group (Petrovietnam), Holcim Azerbaijan and HB Co Ltd. At the AITF travel exhibition, Turkey was the partner country and Bulgaria made a first appearance as a guest country. As usual, a range of conferences, sessions and seminars were held at exhibitions, and intensive business programmes were developed which led to two international agreements being signed. The first, between the UNWTO and Azerbaijan’s Ministry of Culture and Tourism, paved the way for the Taste of the Silk Road joint project and the Gastronomy, Culture and Tourism international conference. The second agreement related to developing tourism relations between Azerbaijan and San Marino and was signed by the tourism ministries of the two countries. Daily news publications were produced for several events, and Iteca’s exhibitions were accompanied by entertainment programmes, gala dinners and go-karting competitions, giving the exhibitors a memorable impression of their work at the events. In 2012 Iteca Caspian also co-organised several international events, including the SOCAR OGPC Forum, dedicated to presenting projects in the oil and gas processing and petrochemicals sectors, and delegates were impressed by the quality of visitors and the event’s organisation. BITC 2012, the international tunnelling and underground construction in urban areas conference, was held in September to great acclaim, organised on the initiative of the Azerbaijan Tunnelling Association for the first time, and the 7th Internet Governance Forum was held alongside BakuTel 2012 in November, a major ICT event welcoming over 2,000 delegates from around the world. The successes of 2012 have confirmed Baku’s status as the exhibition centre of the region. New products and services were presented, international cooperation was established, and the flow of investment in the country was increased - to take an example, at just one exhibition, Aqua-Therm Baku 2012, 23% of all exhibitors signed contracts right there at the event and 84% are expecting to seal agreements as a result of the exhibition. 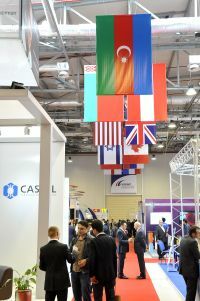 Azerbaijan’s economic growth, the subsequent increase in the country’s investment appeal, and its business climate in general are all clear factors in the success of Iteca Caspian’s exhibitions in recent years - as is the work of ITE’s international agents, including ITE Moscow, EUF in Turkey, GiMA in Germany, ITE China and ITE Gulf, in bringing international firms to exhibit in Baku. Several events were held with the official support of influential organisations such as the UN, the WTO, the Permanent Secretariat of TRACECA, the International Telecommunication Union and the Regional Commonwealth in the field of Communications. Iteca Caspian’s events undergo annual exhibition audits from UFI, the Global Association of the Exhibition Industry, whose approval signifies a high organisational level, influence on business development and the industry, and the reliability of organiser-produced exhibition statistics. The company’s 2013 exhibition season will begin in April. Over 20 exhibitions are scheduled for 2013, including the launch of a brand new event - CATEF 2013, the Caspian International Aqua Technologies Exhibition and Forum held from 11 to 13 April. The telecoms exhibition BakuTel will be held before the previously announced dates – the event will now take place from 25 to 28 September 2013. Caspian Oil & Gas 2013 is set to be an important event, with a special programme planned to mark the 20th anniversary of the exhibition. A full event calendar for 2013 is available at www.iteca.az.